Great news, it is finally here! The name of the App once again is: ‘Mighty Data Top-Up’ and below is what you see when you launch the app. 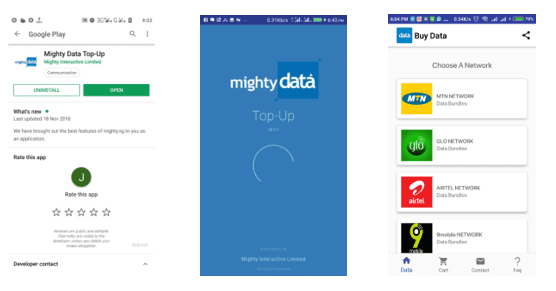 Using the Mighty Data Top-Up app, you can purchase your cheap data bundles for MTN, Glo, Airtel, and 9Mobile networks easily with convenient payment options. How can I Get Data from the Mighty Data Top-up App? 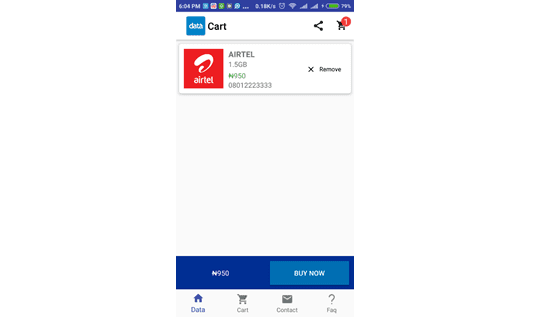 The process of purchasing data from this app is very easy, you will see as we explain below step by step. Click this link https://play.google.com/store/apps/details?id=mighty.data.topup to download the App. Using your android device, open the Google Play app. Search for ‘Mighty Data Top-Up’ and download the app. After the download is completed, open the app. 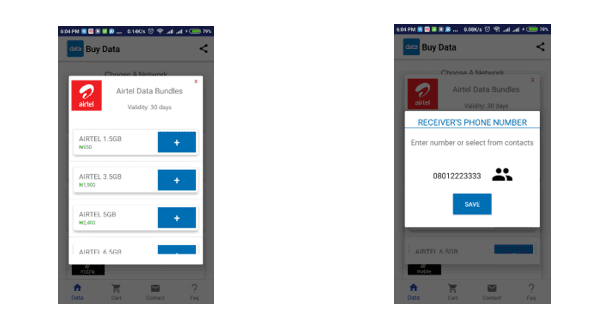 From the app, select the Mobile network you want to purchase your data from. The list of all available data plans on that network will be shown. Choose the data plan you want to purchase from that list and input the phone number you need the data sent to and save it to cart. 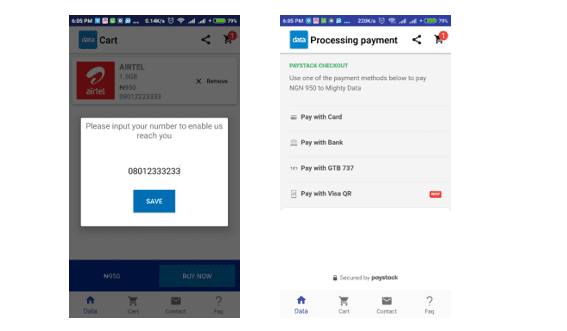 If you need multiple data bundles, you can repeat this step several times till you have successfully added all the data bundles you need to cart. 4. Go to cart and check out for payment. Go to the cart when you have finished your purchases. If the details in the cart are accurate, check out by clicking the Buy Now button. For contact on your purchase, enter your phone number that you can be reached on and choose a convenient payment option. Input the relevant details and send. Once payment has been is successful, your data purchased will be confirmed and you will receive the data you paid for. And that is all you need to get your cheap data plans with the Mighty Data Top-Up app. It is that easy and convenient. Please note that the app only works for Android version 4.0 and upwards. If you are still using an older version of Android, seriously, upgrade. The Mighty Data Top-Up app is only available to Android users at the moment. But iPhone users, worry not! An iOS version is in the works and will be released soonest. 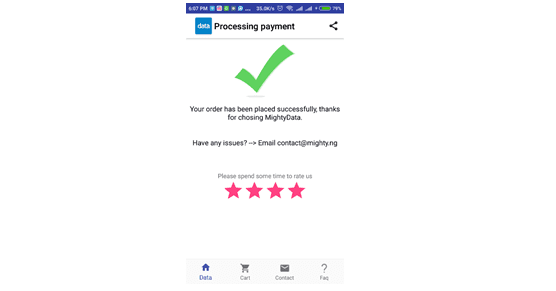 For iPhone users as well as others who for any reason cannot download the Mighty Data Top-Up android app, Mighty Data is still available to you via our website www.mighty.ng/data. You can also contact Mighty Data via Call/SMS/Whatsapp on 07033044456, 09097619649, 08185920059. So what are you still waiting for? Download the Mighty Data Top-Up app and start getting your cheap mobile data with the App now! Are you enterprising enough to resell Mighty Data and earn yourself some extra income? We would be delighted to work with you. Visit www.mighty.ng/agent to learn how you can get started as a Mighty Data agent.